BEST OF THE BOLOGNA HANDBOOK contains carefully selected articles from the EUA Bologna Handbook devoted to the most critical and pressing issues in European higher education. Since it was first published in 2006, the Handbook has consisted of a series of specially commissioned articles which cover the full range of Bologna action lines. It provides comprehensive coverage of the basics, any developments and every dimension of the Bologna process, and focuses on the actual implementation of specific elements of it, along with analyses and examples of good practice. The Bologna Handbook has proved to be a successful vehicle for analysing and reporting on the implementation of the Bologna reforms. 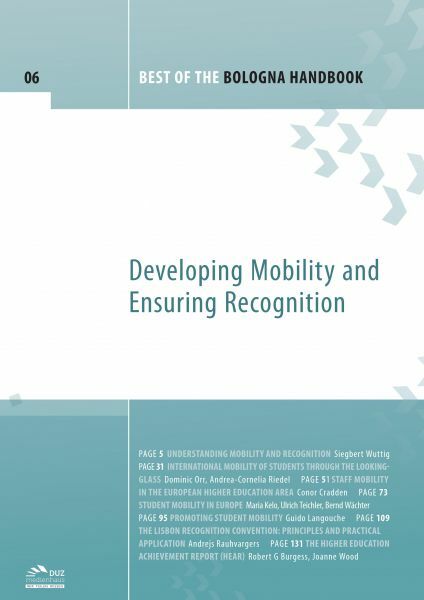 More than 1700 higher education institutions from 49 countries have already used the publication in their work. However, the Handbook was originally available in the form of quarterly supplements on a subscription basis only. Many readers have asked us if it is possible to purchase articles devoted to a specific issues without subscription. In response we have decided to choose some articles published in the Bologna Handbook and publish them separately in the form of this booklet series.